Tulum in Mexico is easily accessible from everywhere in North America. It’s a rare thing these days to be able to say that you own real estate on or close to “Grade A” beach. By that, I mean truly stunning beach, either Caribbean white sands or the bluest stretches of the Pacific Coast. We’ll discuss the following three beach areas in detail at our upcoming International Real Estate Investment Forum…and for those in the room, $91,500 in savings will be on offer. Beach #1: Outside Jama, on Ecuador’s north coast, you’ll find your eyes drawn to the steep hills that rise from the beach. A luminous green for nine months of the year, these hills are home to brightly colored birds and butterflies. Here you’ll find a “best in class” project on one of the Pacific’s finest stretches of coast. There’s nothing like it in the area. The highest point in the project is a four-minute stroll through landscaped gardens to the beach. Ground-floor condos have views that open up to the blue ocean and along the coast and rich green forested hills. The higher the condo, the more expansive the views. From the roof terrace your perch is the finest in the community. Maybe the finest on the coast. At $85,600, these condos are a great buy. A free fit out will be offered exclusively to attendees at the International Real Estate Investment Forum…a saving of $12,500. Beach #2, Pick “A”: Tulum in Mexico is nature and culture…wild and beautiful…and has the nicest stretch of white powder sand, arranged as nature intended, that I have set foot on. 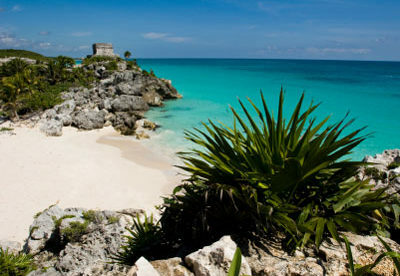 Beach #2, Pick “B”: Tulum is easily accessible from everywhere in North America. The government has realized the potential. They have a plan, including major new infrastructure that could bring 11 million tourists to this stretch of coast a decade from now. As the Path of Progress rolls through, land…and a five-acre lot in particular…will be a rare and valuable commodity. Beach #3: The middle of town is the best spot in Las Terrenas, Dominican Republic, for swimming. Brilliant, bright white sand. The water is flat, clear and turquoise. Just back from the beach, the glass front of new modern condos glint in the sunshine. The buildings are low density, nestled in the palm trees. Space within and around the condos is generous. These are the type of large condos you would expect to cost $2 million or more. But here, $450,000 buys you a luxury two-bedroom unit. Attendees at the International Real Estate Investment Forum get a 10% discount, a saving of $45,000. These are a small example of the deals and special terms available to attendees. Find out more about everything that will be in the room at the International Real Estate Investment Forum here. Editor’s Note: Ronan McMahon is the director of Pathfinder, IL’s preferred real estate advertiser.